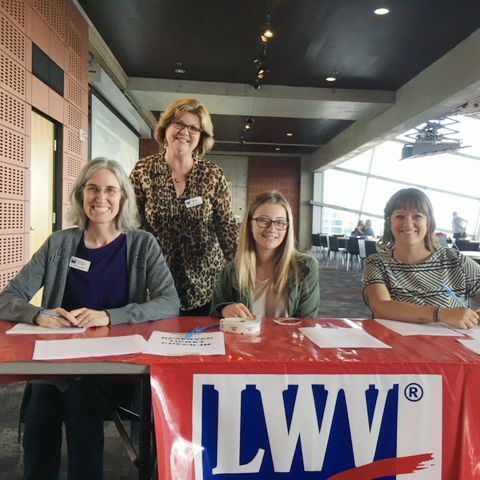 One of the best ways that League members can encourage voter participation is by getting out into the community and letting the public know about all the wonderful resources LWV has to offer! Please join us on April 24 at 5:30pm in our League office for a fun and informative two-hour training on effective tabling. All League members are encouraged to attend as we master the skills needed to get our essential message to the public. The training will include tabling techniques, voter registration training, and a run down on the wonderful resources and opportunities the League of Women Voters offers. Whether you are a seasoned member or are brand-new to the League, you will learn something new and gain confidence in your outreach skills. All members attending the training will receive an LWV T-shirt. If you plan to volunteer at a naturalization ceremony in the future, please be sure to attend this training. RSVP to Jenny Avina at youth [at] lwvsandiego.org by April 19 with preferred T-shirt size. RSVPs welcome after the 19th but no guarantees on T-shirt availability.